October Afternoon's 12"x12" alpha sticker sheets are printed using offset lithography for the best possible color-coordination with the line's pattern papers. We use only uncoated sticker material, making our stickers fully writeable and gluable -- perfect for a variety of papercrafting techniques. 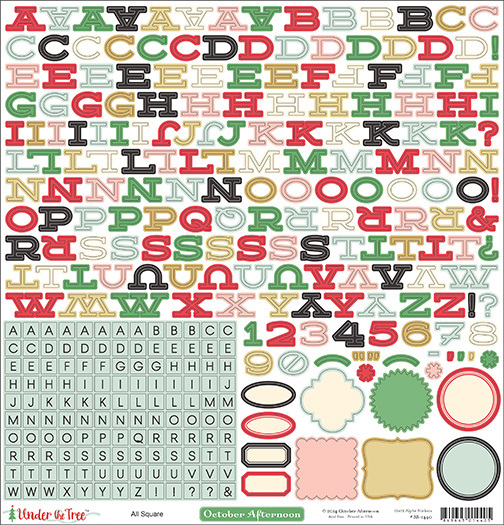 This "All Square" alphabet design contains two styles of alphabets (small and large) as well as several label stickers. The design is precision die-cut giving you the most exact and intricate sticker shapes in the industry. Cardstock-weight and acid-free.